The field experiment took place in the northern Fram Strait up to the Gakkel ridge at 84 N this was more than 220 kilometers from the ice edge. The Hovercraft RH Sabvabaa were used in tandem operation with KV Svalbard as the host vessel. This concept is promising for future oceanographic and acoustic field investigations in the high Arctic. The primary scientific goal of the field experiment was to collect oceanographic and acoustic data to be able to optimize the two year-long acoustic thermometry experiment to be implemented in 2014. Acoustic thermometry provides mean temperature over large ocean volumes building on the simple principle that sound propagates faster in warm water than in cold water. The acoustic thermometry system will be deployed in September 2014 as part of the UNDER-ICE project. The thermometry system is designed to provide acoustic measurements of mean ocean temperature between the moorings and oceanographic point measurements at the fixed mooring locations using standard oceanographic instruments. 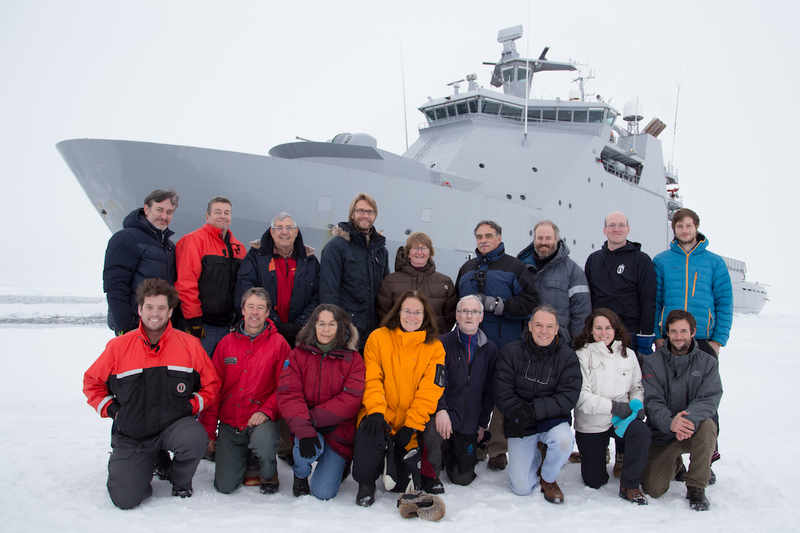 The system will provide year round observations for two years.The UNDER-ICE project is funded by the Research Council of Norway and co-funded by GDF SUEZ E&P Norge AS. Another important objective was to test acoustic communication under the ice. Different communication signals were sent from sources hanging over the side of the ship and received at acoustic ice stations with different separations up to 100 km. This work is carried out by Woods Hole Oceanographic Institution in collaboration with NERSC. As part of the WIFAR project, NERSC and Scripps Institution of Oceanography, deployed a Integrated Ice Station comprising a Aanderaa meterological station, 3 axis accelerometer to measure the sea ice vibrations, and a hydrophone array to measure the sound under the ice. Ocean waves were measured in open ocean using a sail buoy rented by NERSC from Christian Michelsen Research.The WIFAR project is funded by the Research Council of Norway and co-founded by Total. Several drifting ice tethered platforms deployed in April 2013 at the North-pole by other international projects were searched for, located and recovered at 84 N.